Lagoon: Land of Druids (Funded on Kickstarter) is a game for 1-4 players that plays in about 1 hour. Lagoon is the first world that ever was. Boundless spiritual energy flows through the land, and is the source of all the world’s magic. All was in balance, until divinity was split by the rise of humanity into three energies that now vie for dominion of Lagoon: Elemeen is the energy of the spirit, Vowelon is the energy of the heart, and Deonin is the energy of the mind. In the end, one of these three energies will become Lagoon’s destiny. It is up to humanity’s druids to unify Lagoon. 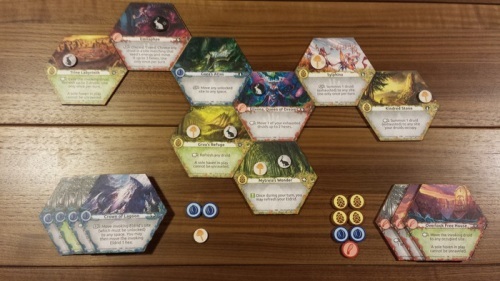 Lagoon: Land of Druids is a game about forging the destiny of a world. Lead your circle of druids in search of enchanted sites that offer magic powers, and use them to bend destiny. Each site is aligned with one of three divine energies. You will alter the balance of power among these energies by exploring new sites, adding them to the board, and by magically unraveling sites, removing them from the board. At the end of the game, the energy with the most sites in play becomes Lagoon’s destiny. Position yourself on the right side of destiny, and you win! Lagoon is a fun and inviting tile placing game with rather simple mechanics, but a system that builds complexity as the game progresses. Players take turns performing a set of simple base actions, all clearly defined on the set of “cheat sheets” that come with the game. Those actions can expand, shrink, or alter the playing field, which in turn alters the rules of play (much like Magic or Fluxx). Each hex tile has two sides, with 2 of the 3 colors/energies in the game. Each side also has text which often impacts or slightly alters the rules of the game, either once or while the tile is in play. Placing a tile gives you a seed of that color, which can be used to remove a tile later, or as victory points. Each color is strong against one other color, and weak against the other (very much like Rock / Paper / Scissors). The goal of the game is to collect as many seeds of the winning color, and tiles of the losing colors, as you can. To do that, you need to occupy or use seeds of at least one opposing color. You must maintain some balance, but in a way that favors the color you want. Other players are doing the same, likely for different colors. Since some tiles can interact and cause complex patterns, when, where, and how those tiles come out adds both randomness and strategy when it comes to placement and side/color choice. Combine the fact that only one side of a given tile is played per game, and the ability to randomly remove tiles in sets of 3, and the game becomes exponentially replayable. If you like the idea of concepts from Magic, Fluxx, and Hive blended together, you will love this game. Well worth the value in just game mechanics. Throw in the stunning artwork, and sturdy components, and rules for single player and team-play games, and it’s a steal for the price. 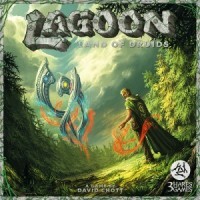 Add a Review for "Lagoon: Land of Druids"